Yiya Pilot Kick-Off Engineering Educator Workshop! 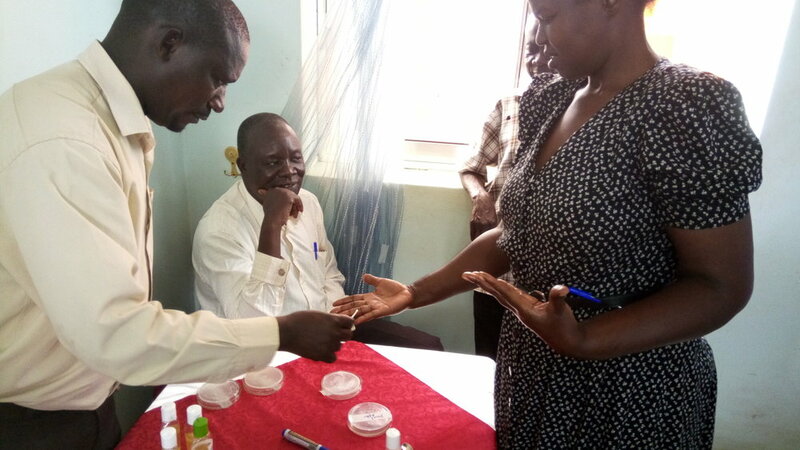 We are so excited to have conducted our very first teacher training in Lira District! This workshop, which was the official kick-off to our Yiya program pilot, ran for three days in Lira. We had a great attendance of secondary teachers from all six Yiya pilot partner schools! The workshop covered an intensive training in project-based learning, as well as strategies for teaching students to apply the science and mathematics topics they learn in school. Our team focused in particular on how to leverage engineering (designing new technologies) to create a natural application for science and math lessons. In addition to practicing general strategies, participants also learned and practiced the lessons in the first Yiya engineering module, the clean hands unit (Keep 'Em Clean! Chemical Engineering: Hand Sanitizers). Our team believes very strongly in practicing what we preach! Therefore all our workshops are hands-on, minds-on, project-based, and learned-centered! In this workshop, teachers participated in each of the lessons as if they were the students themselves, with opportunities to ask questions and role-play as students! After each lesson we set aside time for them to switch back into "teacher mode" and reflect on the learning experience, share their thoughts, and offer feedback or concerns from an educator's perspective. This interactive and learner-centered style of teaching is the same methodology that we hope teachers will gradually adopt in their classrooms as well! After having attended this kick-off training, we now call our Yiya pilot partner teachers "engineering educators," because they are committed to working towards solving problems in their community by empowering students with actionable, 21st century skills that they can use to engineer technological solutions! Newer PostTeaching in Partner Schools Begins! Older PostMOUs signed with 6 Partner Schools!